If you walked into Burt Khan on Friday night you would have walked into a Brazilian Carnival. 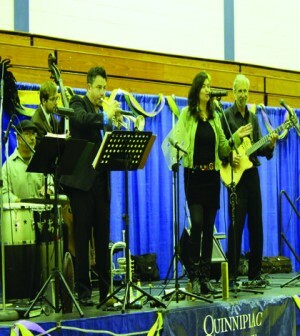 The Latino Cultural Society hosted its annual Copacabana Night Friday from 8 p.m. to 10 p.m. There was food, dancing and a band, all of which showcased Hispanic culture. This event has been going on for the past nine years, held during either the last week of September or the first week of October to mark the end of Hispanic Heritage Month. Hispanic Heritage Month lasts from Sept. 15 to Oct. 15. Various South American countries, such as Honduras and Costa Rica, celebrate their independence during this time. There were vibrant streamers and tables set up around the gym; it was decorated with colorful tablecloths and masquerade masks. There was a stage for the band as well as a large area dedicated to dancing. Many guests engaged in salsa, bachata and merengue styles of dance. For those who did not know these styles, a dance instructor was present to guide them along. Though held by the Latino Cultural Society, Copacabana Night sparked interest for students from a of variety backgrounds. Freshman Valerie Pozdnyakova was excited to hear the music. Senior Dan Burdick has always enjoyed Copacabana night. There was a large variety of food at Copacabana Night, from rice and beans to taquitos, enchiladas and even flan, a baked custard dessert. Other students, like sophomore Jacob Ward, attended the event for the dancing. He liked the dance instruction but said he still is not great at these latin styles of dance. For the Latino Cultural Society, the event was not only about exposing students of other cultures to Latino traditions, but providing a senseof familiarity for Hispanic students. President of Latino Cultural Society Dayanara Lopez says the night reminds her of her life at home. Lopez was pleased with the turnout at Friday’s event. She says there were few empty chairs and she believes the event had a positive impact on the QU community. Even faculty staff and students from other cultural organizations, like the South Asian Society, attended. “They’re here to feel our culture,” Lopez said; “this was, she said, exactly what she wanted. Latino Cultural Society Vice President Adriana Quintero shared a similar feeling about how the night turned out.